Can we accomplish this in today’s hectic healthcare environment? We can’t afford not to. Too often, patient complaints stem from poor communication and unmet expectations. Stop to consider how important they are. Look at patients and family members and observe their roles and relationships. Above all, listen to them and ask questions to learn all you can about your patients. There is no better way to understand how to help patients and staff than spending time listening to them. Active listening is a specific way of hearing what a patient says and feels, and reflecting that information back to the speaker. Its goal is to listen to the whole person and provide him/her with empathic understanding. 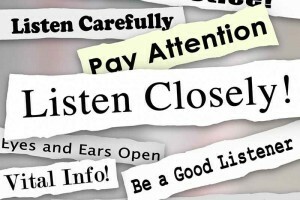 It is the skill of paying gentle, compassionate attention to what has been said or implied. When you listen in this way to patients, you just try to reflect the other person’s feelings and a deeper meaning, which helps them feel, be heard and be understood. You don’t analyse, interpret, judge, or give advice. When patients are listened to in this way, they are less anxious, and are more likely to comply with their treatment plan. Excellent communications is part ‘patient service’, however a big part of this process is excellent interviewing and educating skills. Spending a few moments explaining the reasons for your decisions & your concern for the patient goes a long way. Partnering with patients is critically important – having patients become part of the decision. This works because people don’t argue with their own data! How do we continue to provide high quality, safe patient care that is also valuable to the patient? The First Law states that for patients to be satisfied, not only must they perceive the care to be excellent, but their expectations must be managed as well. The Second Law speaks to the importance of first impressions. Sitting down and spending time initially listening to the patient can both improve perception of care and avoid having to play catch-up ball. However, this can be difficult when waiting times balloon and nerves run thin. Every practitioner knows that once a patient becomes angry, it is hard to turn the conversation back in a positive direction. Spending a few minutes with each patient using the First and Second Laws of Service early in the interaction can save many more minutes in the long run. Effective communication strategies, especially surrounding pain treatment, can significantly improve satisfaction scores, and even lead to better care.